Meet a survivor who benefited from the Rescue Medical Fund this year. See how your support of compassion will make a difference for equally needy animals in 2018. Horrific bite wounds covered his body. One of his ears had been violently torn off, while punctures could be found on his face, neck, and torso. He was found in the middle of the road and rushed to Animal Place. He had likely been mauled by dogs or coyotes. Our veterinarian examined him, removing what was left of his mangled right ear and suturing several open wounds. We named him Vincent Van Goat. Unless you get up close to Vincent (and notice his missing ear), you would never know the trauma he endured before coming to the sanctuary. 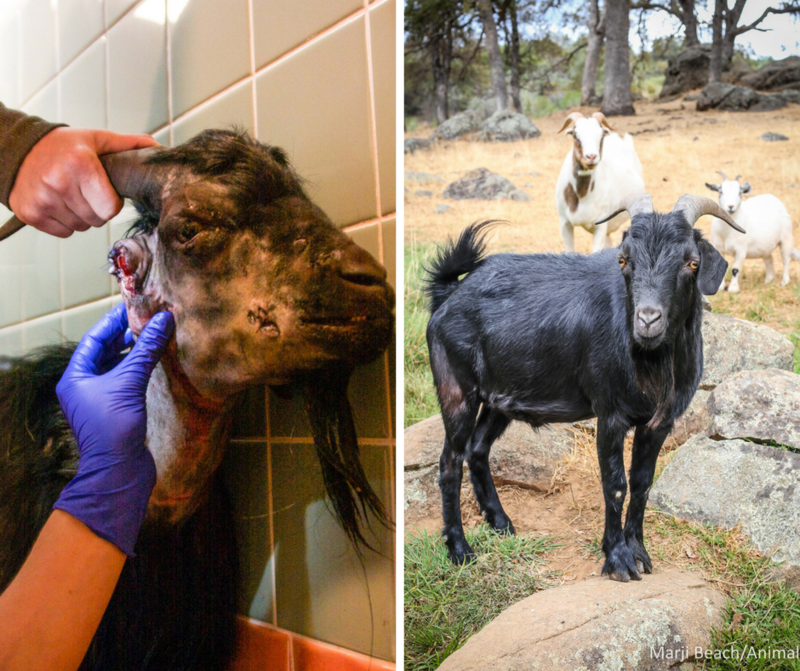 All of his wounds are fully healed, and he has found safe haven with other goats. His good friend is Verna, the smallest of the goats. Thank you for saving this beautiful goat. In a world where there are no laws protecting farm animals, your sanctuary is an Eden and Paradise – a hiding place from the cruelty of this world. All of you folks are just wonderful and amazing. Your compassion and perseverance toward selflessly helping these animals brings hope and joy into my heart. Thanks for saving this little guy. THANK YOU for everything you do for animals!!! !